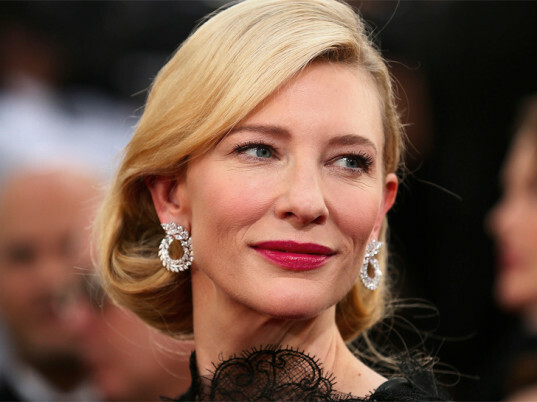 Cate Blanchett made Golden Globes history Sunday night in more ways than one. In addition to winning her third Golden Globe award for her role as a troubled socialite in the Woody Allen film Blue Jasmine, the Australian actress also wore some of the first pieces of jewelry from Eco-Age’s Green Carpet Challenge, an initiative designed to raise ethical fashion’s profile on the red carpet. The laurel-shaped earrings, a collaboration with Chopard, feature 72 marquise-cut white diamonds set in 18-carat Fairmined white gold from small-scale community mines in South America. Cate Blanchett made Golden Globes history Sunday night in more ways than one. In addition to winning her third Golden Globe award for her role as a troubled socialite in the Woody Allen film Blue Jasmine, the Australian actress also wore some of the first pieces of jewelry from Eco-Age's Green Carpet Challenge, an initiative designed to raise ethical fashion's profile on the red carpet. The laurel-shaped earrings, a collaboration with Chopard, feature 72 marquise-cut white diamonds set in 18-carat Fairmined white gold from small-scale community mines in South America.